The combat sport that we know as boxing has long been associated with betting; indeed, the heyday of boxing betting appears to have been when wagering on sport was illegal. 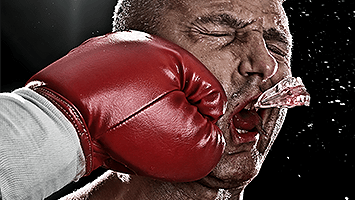 Boxing has long been a fairly simple sport – in the earliest days many millennia ago, it was nothing more than brutal combat, and while the sport has become more civilised and tactical since then, it still has a certain straightforwardness that appeals to sports bettors. But how can you maximise your chances of success when you bet on boxing? Here at Top 10 Sports Betting Sites, we thought we’d put together a comprehensive guide. What are Your Options for Betting on Boxing? The simplicity of boxing doesn’t lend itself to a breadth of betting markets on a par with that of such other sports as football (soccer), but there are still a fair few types of bet that you can place. ‘Bout betting’ - this is basically the term for outright winner betting. You can back either participant to take outright victory or instead wager on a draw, although the odds for the latter are typically very long, reflecting how uncommon draws are in boxing. ‘Round betting’, which as the name suggests, involves picking not only who you think will win, but also in which round you expect them to triumph. Similar to this is ‘round group betting’, which works in a similar way but provides a bit more flexibility in terms of picking the round in which the winner will be decided. ‘Method of victory’ is another broad, and popular betting method, whereby the punter bets on how the win will be achieved out of a choice of straight knockout, technical knockout or disqualification. You can even bet on whether the fight will last all 12 rounds. You can also bet on the fight itself - whether the fight will last for more or less than an allocated number of rounds (over/under rounds). For instance, if you bet that a fight would last more than 7.5 rounds but it stopped in the 7th or before, you would lose, whereas if the fight lasted until the 8th round or later, you would win. While there are certain ‘rules of thumb’ from other areas of sports betting that will also serve you well in boxing betting, they are not always so useful. For example, it is often fruitless in boxing betting to simply back the favourite to win each fight, as many boxing matches today are mismatches, with one fighter being heavily backed over the other. So, it’s important to look beyond the obvious markets if you are interested in the best-value boxing betting opportunities, but it’s no less important to look beyond each fighter’s basic career statistics. Many fighters can build up strong reputations on the basis of a long string of wins by simply taking on mediocre competitors for a while, meaning that when they do schedule a bout with a more capable fighter, they may be hyped beyond their true capabilities. Boxing betting is much like any other kind of sports betting in the importance of carefully researching each competitor beforehand, including their specific circumstances. A boxer may have a high percentage of career wins, but how many of those wins were against competitive fighters? Are they on the way up in their career, with the hunger to prove themselves, or are they an established fighter who may now be in decline and vulnerable against a younger talent? It’s especially crucial to look at the fighter’s last few bouts and what may have happened to them since then. Has the fighter recently lost an unbeaten record or suffered a major injury, and may therefore be lacking in confidence for their next bout? Have they been suffering from cold or flu – which can really impact on motor performance – or have they been having problems with gaining or losing weight? Maybe they’ve recently switched coach or been seen falling out of a nightclub at 3am? These factors can all make a difference. Another potentially very influential factor is when a fighter makes a comeback to professional boxing after a number of years, as they often aren’t as physically and mentally prepared as someone who fights regularly. A home crowd supporting a particular boxer can also make a big difference, even influencing the referee to make decisions biased in the home fighter’s favour. However, there’s also plenty that you shouldn’t do when you are trying to bet on boxing – not least, getting caught up in the pre-fight hype. A lot of things are likely to be said by both sides that aren’t greatly representative of the truth, and there can be many sensationalist or contradictory news reports, which increases the importance of getting your news and analysis from a credible source like Sky Sports or ESPN. Being a success with your boxing betting may be principally about the above tips, but choosing the right boxing betting portal for you – with the most rewarding bonuses and promotions – also shouldn’t be overlooked in its importance. Allow us to be your guide to the finest sports betting sites out there, by consulting our extensive reviews and ratings of well-known and obscure gambling portals alike.